ASSEMBLY MEMBER for Adjei Kojo Electoral Area at Ashaiman in the Greater Accra Region, Romeo Elipklim Akahoho, has declared his interest to contest the Member of Parliament (MP) position in the Tema-West constituency. According to him, after 12 years of steering the affairs of the area as an assembly member, he would no longer contest the next election as an assembly for the area, adding that it was time for him to pave the way for others to contest the position. Mr. Akahoho further noted that after going through the primaries on the ticket of the National Democratic Congress (NDC), and hopefully winning, he would definitely contest the MP position in the 2020 general elections. He was optimistic of ousting the incumbent New Patriotic Party (NPP) MP for Tema-West, Carlos Kingsley Ahenkorah. According to him, during his 12-year tenure as an assembly member, his party stalwarts reposed enormous confidence in him. He stressed that residents living in areas such as Adjei Kojo and Klagon are bedeviled with bad roads – a situation he described as worrying. Mr. Akahoho disclosed that during his tenure, he served on every committee. He was a sub-metro chairman for Tema-West constituency, and also served as a presiding member. “With these rich and enviable track records, I believe I have what it takes to lead the good people of Tema-West”, he stated. According to him, it was through his efforts that made Adjei Kojo an autonomous electoral area, which was formally under Klagon. He further stated that Adjei Kojo is becoming a fast-developing community and he has put measures in place for the town to be divided into three electoral areas. “I believe I have the capabilities of changing the fortunes of Tema-West constituency as a prospective MP for the area”, he declared. Mr. Akahoho made these assertions in an interview with a section of the media after donating some musical instruments to the Presbyterian Church of Ghana (Nazareth Congregation) at Adjei Kojo, a suburb of Tema. He explained that he makes donations to churches within his jurisdiction on his birthdays, hence that kind gesture. 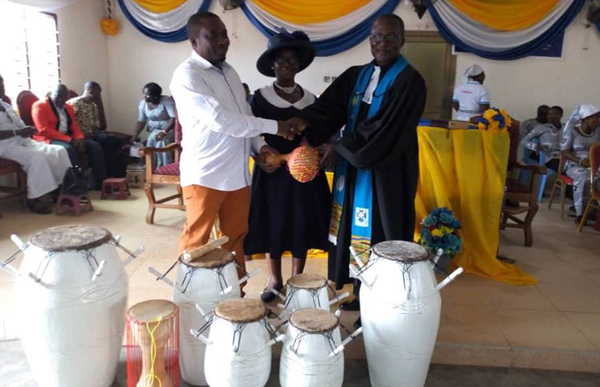 “Donation of musical instruments is not the first of its kind, as same has been done to several churches in my area in previous time”, he pointed out.